Soft and gentle rich text editing for Flutter applications. Official releases of Zefyr can be installed from Dart's Pub package repository. Note that versions from Pub track stable channel of Flutter. If you are on master channel check out instructions below in this document. And run flutter packages get. Continue to https://github.com/memspace/zefyr/blob/master/doc/quick_start.md to learn more about Zefyr and how to use it in your projects. Experimental: Added non-scrollable ZefyrView widget which allows previewing Notus documents inside layouts using their own scrollables like ListView. Breaking change: renamed EditableRichText to ZefyrRichText. User code is unlikely to be affected unless you've extended Zefyr with custom implementations of block widgets. Breaking change: renamed RenderEditableParagraph to RenderZefyrParagraph. User code is unlikely to be affected unless you've extended Zefyr with custom implementations of block widgets. Added ZefyrScope class - replaces previously used scope objects ZefyrEditableTextScope and ZefyrEditorScope. Unified all shared resources under one class. Breaking change: removed ZefyrEditor.of and ZefyrEditableText.of static methods. Use ZefyrScope.of instead. Fixed autofocus not being triggered when set to true for the first time. Allow customizing cursor color via ZefyrTheme. This version introduces new widget ZefyrScaffold which allows embedding Zefyr in custom layouts, like forms with multiple input fields. 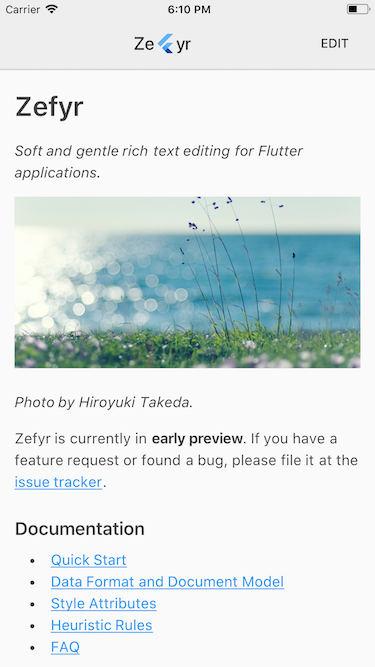 It is now required to always wrap ZefyrEditor with an instance of this new widget. See examples and readme for more details. There is also new ZefyrField widget which integrates Zefyr with material design decorations. Breaking change: ZefyrEditor requires an ancestor ZefyrScaffold. Upgraded to url_launcher version 4.0.0. Exposed ZefyrEditor.physics property to allow customization of ScrollPhysics. Added basic ZefyrField widget with material design decorations. Breaking change: ZefyrImageDelegate.createImageProvider replaced with ZefyrImageDelegate.buildImage. Fixed redundant updates on composing range for Android. Added docs for embedding images. UX: User taps on padding area around the editor and in empty space inside it now look for the nearest paragraph to move caret to. UX: Toggle selection toolbar on double tap instead of refreshing it. Fixed: Prevent sending excessive value updates to the native side which cause race conditions (#12). line 97 col 21: Avoid wrapping fields in getters and setters just to be "safe". line 99 col 3: Avoid return types on setters. line 99 col 12: Avoid wrapping fields in getters and setters just to be "safe". line 105 col 3: Avoid return types on setters. line 111 col 3: Avoid return types on setters. line 70 col 16: Avoid wrapping fields in getters and setters just to be "safe". line 72 col 12: Avoid wrapping fields in getters and setters just to be "safe". line 172 col 7: Avoid using unnecessary statements. line 184 col 3: Avoid return types on setters. line 102 col 17: Avoid wrapping fields in getters and setters just to be "safe". line 104 col 3: Avoid return types on setters. line 104 col 12: Avoid wrapping fields in getters and setters just to be "safe".